No-line coloring on white is one thing. On Desert Storm, it’s another entirely! I colored this by keeping the stamp and paper in the MISTI as I colored so I could keep re-stamping as lines faded away. And used a little pencil to add some details too small for my Copics! Watch the video below or click HERE to see it in HD on YouTube. Love this card. I have never used copic markers before, though I am thinking of making an investment and get the colors for this card. Another option – how do you think water colors or colored pencils would work? I love this card. It is so beautiful! You make this look so easy and you are an encouragement to many! Thank you very much. I don’t know why but I didn’t get a mail about this post. Gladly I saw it when I was watching an other video from you. I love this card, the image was indeed asking for a vintage look. Gorgeous! Thank you so much for showing Sandy and have a nice weekend. This is touching. I love Mo Manning images, and you bring them to life. Thank you for all the tips you shared in the video. What a great video. I never thought to use Copic markers on Desert Storm cardstock, and it looks a little tricky, but will give this a try. The white pencil highlights at the end added so much. It’s a beautiful card that is on my list of “Sandy Faves”. Hmmm, wonder if you have ever considered adding a Christmas card to your stationery offerings on Society 6; this would be the one! I love no line coloring and this is a beautiful example of it! Thanks for sharing your talent! Beautiful. I’m getting excited for the tag series. Sandy, I have watched hundreds of your videos and I know this shouldn’t surprise me but this card is AMAZING!!! What a talent you have been given! I adore this image. Thank you for sharing your talent with us. You are amazing. I plan on attempting this but, what kind and color of ink did you use to stamp the image for your no line coloring? I have the same question!! Your card is so pretty, love Mo’s image. The way you’ve colored it is amazing! I so love the vintage effect, & the snow effects…Wish I could color like you Sandy! Just beautiful! I love, love, looove this! The stamp is adorable, and your colour combination is gorgeous! I think I will need to get this stamp, but you know me, I will probably do it in pencil (I have more pencils than Copics).PS: I love winter too! This is just a beautiful card – period. Between you and Mo Manning, I’ve hardly seen anything that touches the heart more than this. You understand the colors and have mastered the techniques, and Mo delivers the image. But how would we know this was Mo Manning’s artwork? The description of the stamp says nothing about the artist. A close inspection would tell me this is Mo, but when there are dozens of new Christmas stamps from this one maker, it slipped right past me. Mo was given credit in the video. 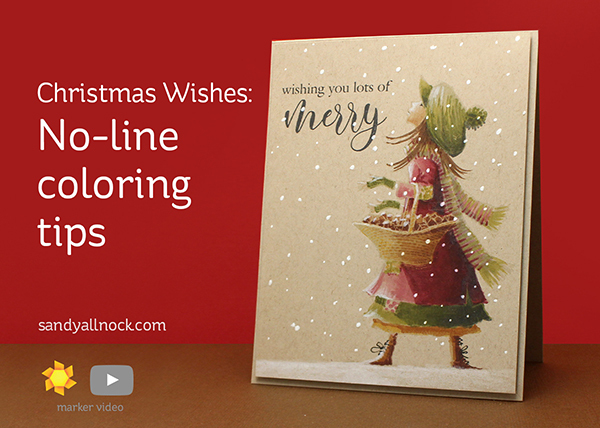 Perhaps you might want to watch the video and listen to all the coloring tips that overflow from this video.